Those who know this tree know it is anything but heavenly. 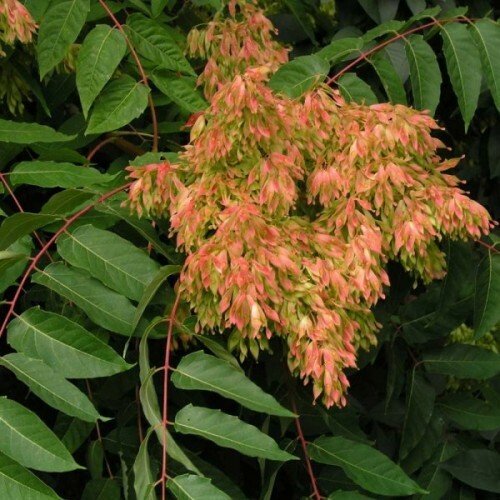 Tree-of-heaven is a pervasive, aggressive, fast-growing weed tree with an extensive root system that’s notorious for damaging mortar and building foundations. The roots also emit a chemical that reduces growth and seed germination of other plants growing nearby. 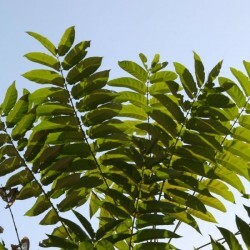 Tree-of-heaven originates from China and Taiwan, but has become naturalized in temperate areas across the globe. Specimens are weak-wooded, short-lived and develop a broad, arching canopy. 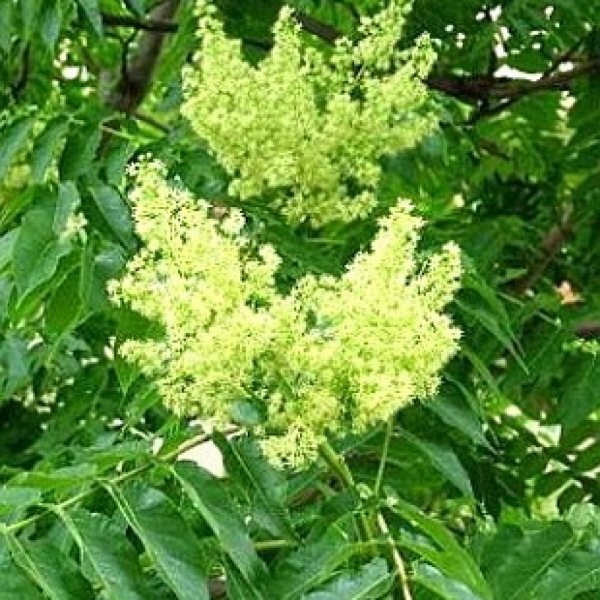 The large, compound leaves of this tree are deep green, coarsely ferny and have a malodorous smell reminiscent of burnt rubber and peanut butter. Each leaf can have as many as 25 lance-shaped leaflets. 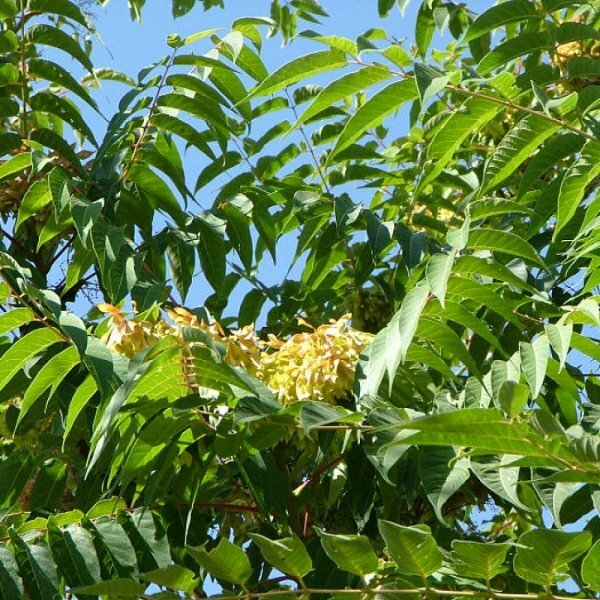 This species is mostly dioecious, which means trees produce either male or female flowers, though some trees may have perfect, or bisexual, flowers. 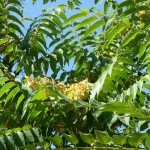 The tiny, greenish yellow flowers bloom in spring or summer, depending on geography, and the male flowers emit a foul odor. 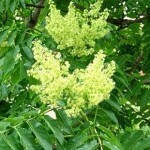 Bees, beetles and other insects pollinate the blooms. 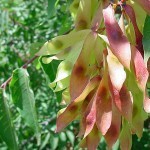 The females produce massive clusters of papery pink or reddish brown seeds. Thousands of the winged seeds (samaras) are produced and germinate quickly and easily. The brittle stems and trunk are covered with smooth gray bark with lighter gray vertical cracks. Germination Scarification: Soak in water, let stand in water for 24 hours<br /> Stratification: Cold stratify for 90 days<br /> Germination: Sow seed 1/4 inch deep, tamp the soil, mulch the seed bed. Prick out the seedlings into individual pots when they are large enough to handle, keep them in a cold frame for their first winter and plant them out in late spring[K]. Root cuttings in December. Suckers, planted out in late winter.